Asim Gorashi is a musician who has traveled the long winding road that has earned him a unique background both as an educator and artist. A multi instrumentalist, Asim plays not only Oud and violin, he also sings and plays keyboards, the Arabic lute, Sudanese traditional guitar, mandolin as well as viola, and is one of the sweetest whistlers around. 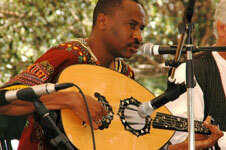 Asim Gorashi is a founding member of the band Sudanese Sound; he has also played in the band of Sudan’s best-loved singer, folk hero and revolutionary Mohammed Al-Amin. He now lives permanently in Brisbane where he is doing his post graduate studies. Asim has performed with Tibet2Timbuk2 on numerous occasions, notably at Brisbane City Hall’s Main Auditorium in June 2008.